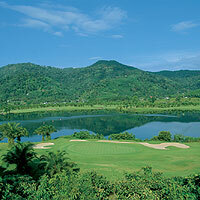 The course winds its way around crystal lake, the largest lake on any of the courses in Phuket. Tee off in front of the clubhouse from an elevated tee, the first hole won't cause you too many troubles. Some excellent holes are spinkled throughout the course and with the addition of some new greens, this is one of my favourites in Phuket. Course conditions are good without being spectacular and the back nine provides some dramatic scenery and golf. Not so many people on this course, very relaxing without the bells and whistles, nevertheless very accommodating staff who are doing their very best to make visitors feel at home. Tee off into crytsal lake during your warm up on the range. Bring a golf cart as the back nine is hilly as well as hotter and sheltered from any breeze. The 18th is one of the hardest short Par 5's around.